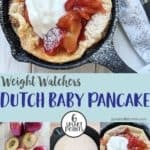 I hadn’t heard of a Dutch Baby Pancake before last year, when there was a bit of an Instagram flurry of all things Dutch Baby Pancake! A Pennsylvanian dish, they are traditionally served with lemon juice and a liberal dusting of icing sugar/powdered sugar but they can be filled with all different kinds of yummy fillings. I decided to make an individual pancake in this cute little cast iron pan . 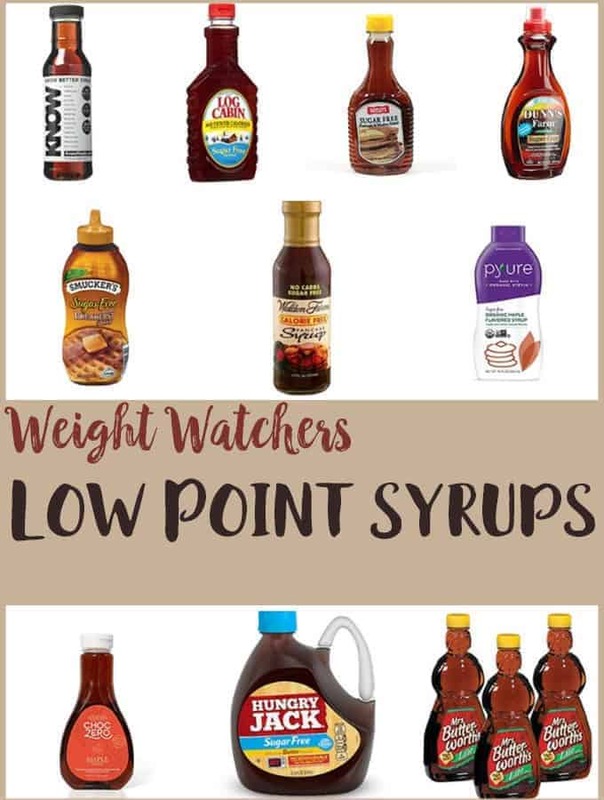 If you are wanting to make more than one, the recipe is easily converted using the servings calculator in the recipe box below. Just type in how many you want to make and like magic it gives you the ingredient conversion! 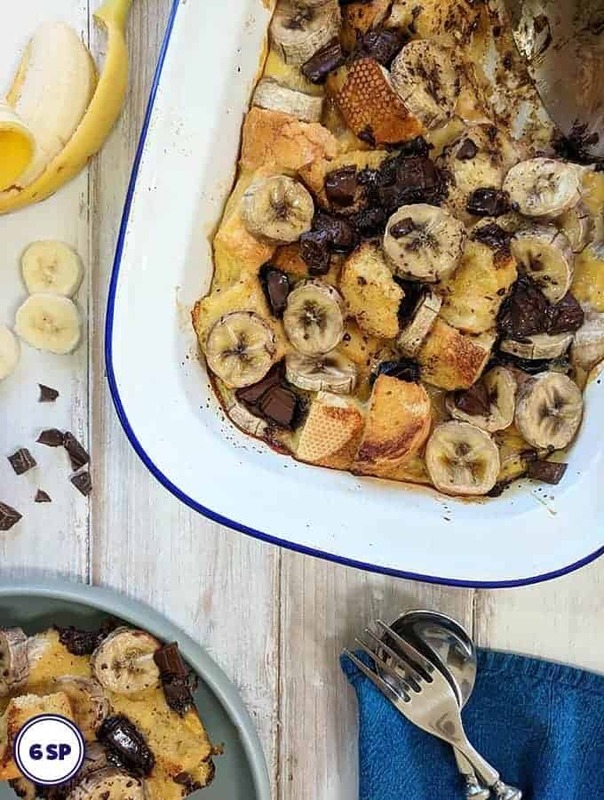 You can use a bigger pan to make this Dutch Baby Pancake (up to 8 inches) but you will get a much thinner, less puffy pancake. It tastes just as good though 😀 . De-stone the plums (see pic 2) by slicing them length ways with a sharp knife. Then using two hands, twist the plum halves in different directions and the two halves should separate. You can then remove the stone easily. Slice into quarters. Place the plums in a saucepan with a tablespoon of water and a little sweetener if required (see pic 3). Gently heat until the plums have started to soften and the skins are starting to come away from the fruit (see pic 4). Spray the inside of the pan with Frylight / Pam and place in the preheated oven to warm up (see pic 5). You want the pan and the oil to be hot enough that when you add the pancake mixture (see pic 6) it sizzles a bit. As I mentioned before, try not to open the oven door before you need to or the pancake may deflate. Once you remove it from the oven, the middle will deflate and you can fill it with fruit and yogurt. I used a 5 inch cast iron pan like this one. You can buy a pack of two from Amazon. 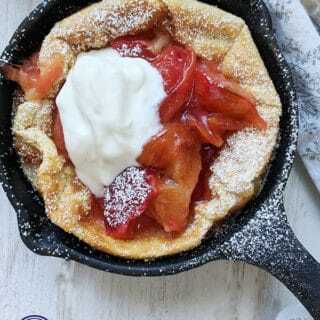 You can use a bigger pan (up to 8 inches) to make this Dutch Baby Pancake, but it will be thinner and less puffy. Keep an eye on the pancake whilst it is cooking to make sure that it isn’t burning. Fill the pancake with a different stewed fruit, such as apples, pears or rhubarb. Serve the pancake the traditional way with lemon and a liberal dusting of icing sugar/powdered sugar. Adjust the points accordingly (For 1 teaspoon of icing sugar, add 1 Smart Point). 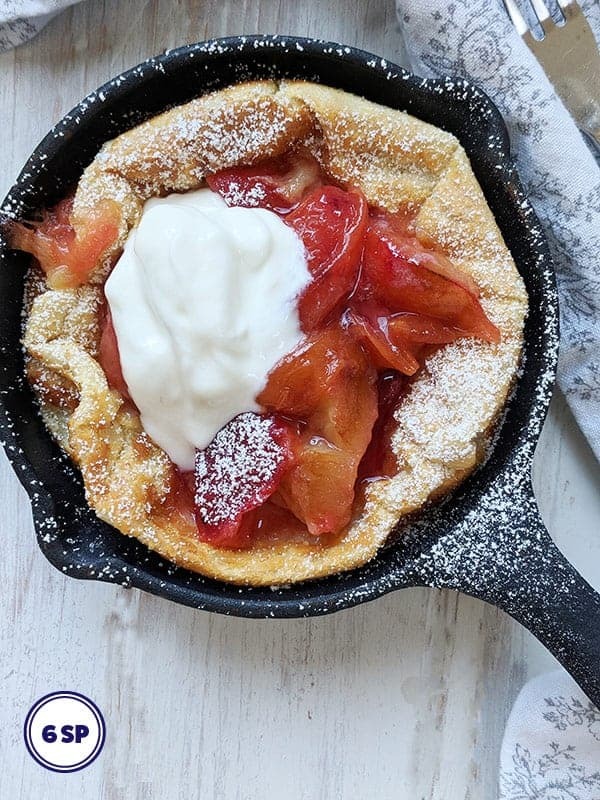 This simple Dutch Baby Pancake with Stewed Plums is 6 Smart Points on Weight Watchers Flex / Freestyle plan. Yum! Remove the stones from the plums and slice into quarters. Place in a saucepan with the water and a little sweetener if required. Heat gently over a low heat until the plums become soft and the skins start to come away from the fruit. Whilst the plums are stewing, spray the inside of a oven proof 5 inch frying pan /skillet with 6 - 8 sprays of Frylight / Pam (you can use a bigger pan but you'll get a thinner less puffy pancake). Put the pan in the oven to heat up. Place the egg, plain flour, milk, salt and sugar into a blender and whizz till thoroughly combined. If you do not have a blender place the dry ingredients in a bowl. In a separate bowl, whisk together the egg and milk. 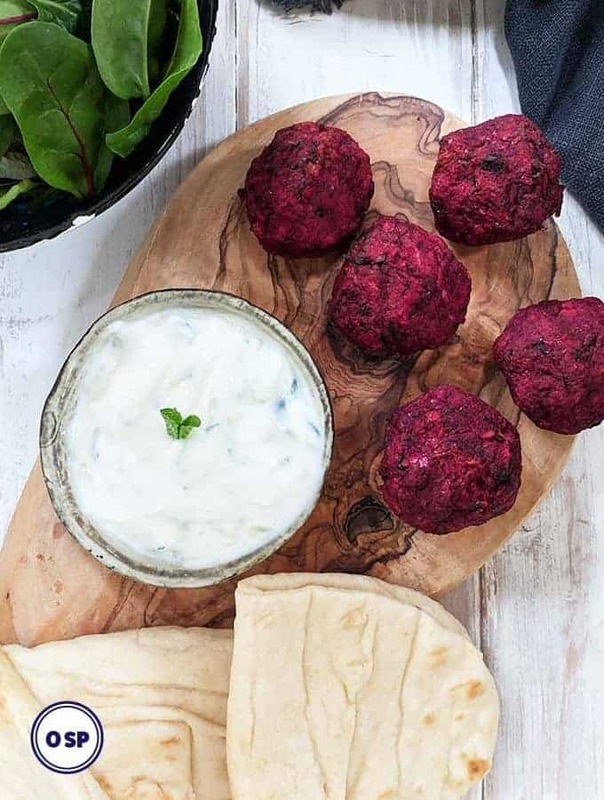 Slowly whisk the wet ingredients into the dry ingredients until you have a smooth, lump free mixture. Set aside the mixture until the pan has heated up (5 - 10 minutes). Remove the pan from the oven and pour the pancake mixture in, return to the oven and cook for 15 - 18 minutes until the pancake has puffed up and turned a golden brown colour. Remove the pancake from the oven. The centre of the pancake will deflate once out of the oven but the sides should stayed puffed up. 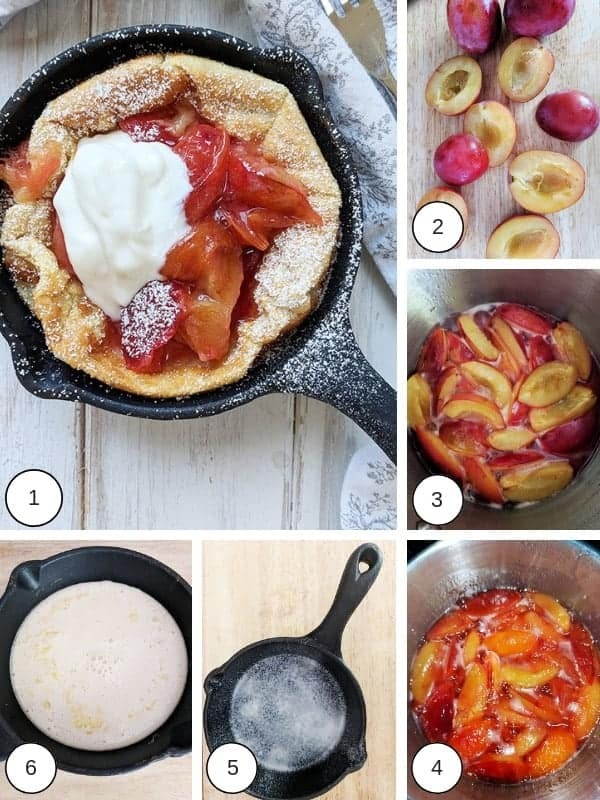 Spoon the stewed plums into the centre of the pancake. Top with a tablespoon or two of fat free natural yogurt and dust with a little icing sugar / powdered sugar.